Kick off Ramadan with this viral video. The holy month of Ramadan started on May 26 (and ends June 24)—if you’re unaware, it’s the month where Muslims fast all day long, while also abstaining from vices such as smoking and gossip. Recently, though, it’s also become a month when Islamic terrorists have been attacking various parts of the Middle East, from Jordan to Kuwait and Saudi Arabia. In a plea for peace this year, Kuwaiti telecommunications company Zain published a lovely three-minute video on YouTube (watch it above), which instantly went viral and grabbed more than 4.5 million views in days. The video deals with a would-be suicide bomber being talked down—well, sung down—by a group of sunny, peace-promoting Muslims, mostly led by an awesome singer with a winning smile who preaches lines like, “Let’s bomb violence with mercy/ Let’s bomb hatred with love.” You’ll also see cameos by several real-life terrorism survivors, proving that violence doesn’t have to beget more violence. Never plan a vacation again. Want to take a certain type of vacation for a certain price, but don’t feel like fiddling with the details? Head to srprs.me (it’s not an acronym; it’s like pronouncing “surprise” with your mouth full of cotton balls), a full-service travel agency that will plan a trip according to your specifications, give you all the travel details and weather reports, but only reveal the destination once you get to the airport. Though it began in the Netherlands in 2014, the company recently launched in the UK and Ireland, and seems on the road for further expansion. The tagline? “You’ll go wherever you’re meant to go.” Sounds like the right combination of whimsy and glossy tech that restless millennials would buy into. Last stand for Trump’s travel ban. Obligatory update on the U.S. travel ban, which could affect anyone hoping to visit the United States from Iran, Libya, Somalia, Sudan, Syria or Yemen: the Justice Department is taking their appeal to the Supreme Court. Many pundits are expecting the high court to uphold the same ruling from the federal appeals court, which stated that the travel ban is unconstitutional and discriminatory. While the ban has caused confusion for Canadian citizens and permanent residents, though, as of Donald Trump’s first 100 days in office, it hasn’t really affected Canadian travel to the United States. 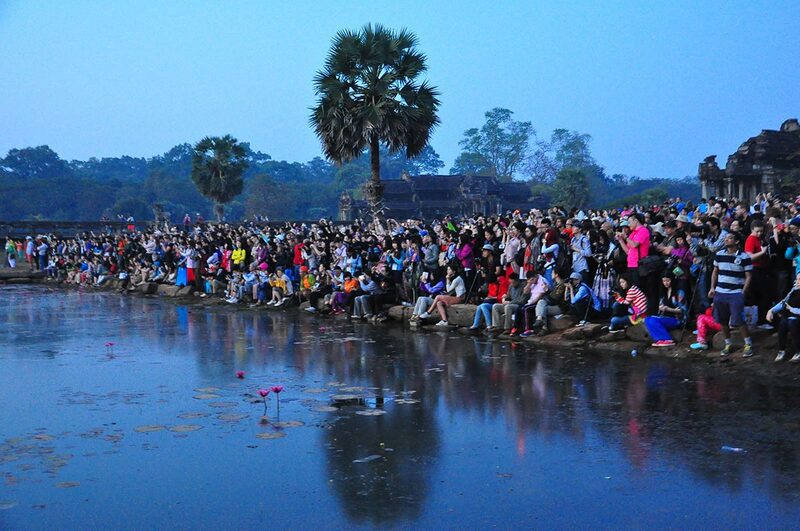 Angkor… what? Regardless of whether you’ve been to the Cambodian temple complex of Angkor Wat, you probably know the shot—dazzling colours, solar flare, shadowed temples in silhouette. But you know what? It’s not that special. In the most popular post on reddit’s travel forum this week, user ivanbco posted the above photo, proving how everyone wants the same view they saw online. “I highly recommend If you do end up going to Angkor Wat for the sunrise to just avoid this and ENTER THE TEMPLES,” he wrote. “They are completely empty and you will feel like Indiana Jones as it’s usually still dark out for a while. Pro tip—bring a lamp.” Having been in the exact same situation—both here and at the Taj Mahal, actually, as soon as both open and the click-happy masses crowd the entrance—I can confirm that this is good advice. Can We Please Stop Talking About North Korea Already?